Vedantu.com - No.1 online tutoring company in India provides you Free PDF download of NCERT Solutions for Class 7 Maths Chapter 1 - Integers solved by Expert Teachers as per NCERT (CBSE) Book guidelines. All Integers Exercise Questions with Solutions to help you to revise complete Syllabus and Score More marks. Register for our free webinar class with best mathematics tutor in India. Students have learnt about whole numbers and integers in Class VI. They know that integers form a bigger collection of numbers which contains whole numbers and negative numbers. What other differences are there between whole numbers and integers? In NCERT Grade 7 Mathematics Chapter 1, Integers, students will study more about integers, their properties and operations. Introduction to Integers, Recalling of Concepts, Properties Of Addition And Subtraction Of Integers, Closure under Addition, Closure under Subtraction, Commutative Property, Associative Property, Additive Identity, Multiplication Of Integers, Multiplication of a Positive and a Negative Integer, Multiplication of two Negative Integers, Product of three or more Negative Integers, Properties Of Multiplication Of Integers, Closure under Multiplication, Commutativity of Multiplication, Multiplication by Zero, Multiplicative Identity, Associativity for Multiplication, Distributive Property, Making Multiplication Easier, Division Of Integers And Properties Of Division Of Integers are some of the topics learnt in this chapter. 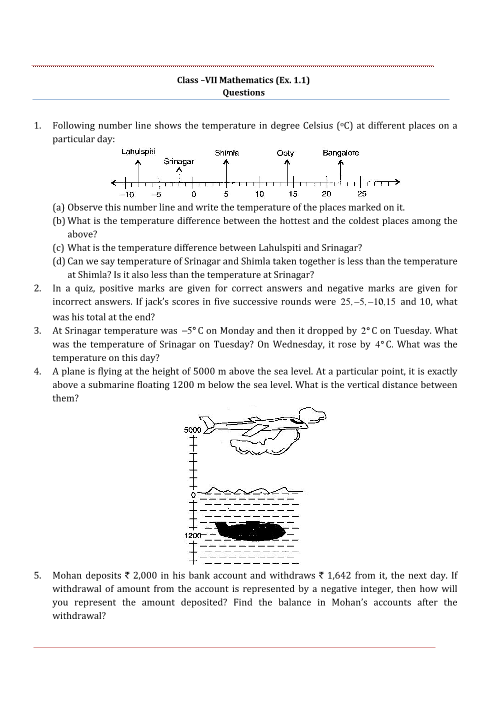 New concepts, interesting problems, solved and unsolved examples and simple language, make NCERT Grade 7 Mathematics Chapter 1, Integers interesting and fun to learn. Summary, Do Yourself Activities and Group exercises help the students to dive into the world of Integers with a throttle and master the topic. Pictorial representation and graphical representation makes the chapter more interactive and clears the concepts in a better and comprehensive manner. This chapter will take the students through the wonderful world of Integers. It will help them to not only develop a grip of the topic but also master the concepts that will help them to perform better. A foundation base for future complex topics, NCERT Grade 7 Mathematics Chapter 1, Integers chapter is easy to understand. Get 100 percent accurate NCERT Solutions for Class 7 Maths Chapter 1 (Integers) solved by expert Maths teachers. We provide step by step solutions for questions given in class 7 maths text-book as per CBSE Board guidelines from the latest NCERT book for class 7 maths. The topics and sub-topics in Chapter 1 Integers are given below. Ex 1.7 - PROPERTIES OF DIVISION OF INTEGERS. EXERCISE 1.4 - 7 Questions with Solutions. Other than given exercises, you should also practice all the solved examples given in the book to clear your concepts on Integers. You can also download the free PDF of Chapter 1 Integers and take the print out to keep it handy for your exam preparation.